Taste the spoils of a safari in South Africa in the peace and tranquillity of the unspoilt African Bush- veld. 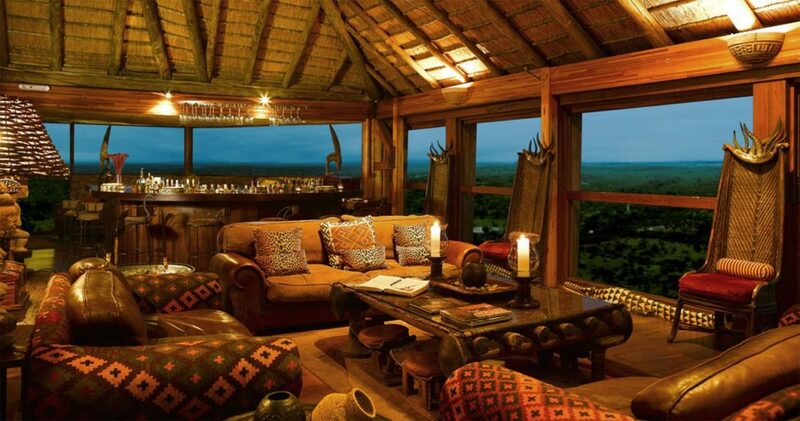 owned by Sir Richard Branson, Ulusaba Private Game Reserve is the ultimate destination for spotting the ‘Big five’! Ulusaba is located in the western sector of the Sabi Sand Game Reserve bordering kruger National Park. At Ulusaba, emphasis is on exceptional personal ser- vice. our attentive staff and superb facilities will ensure that being in the middle of the African Bush does not need to mean foregoing creature comforts. You’ll have the unique sights, sounds and smells of Africa on your doorstep, while still enjoying the kind of style and lux- ury you’d expect from a five star boutique hotel. Because Ulusaba is privately owned, you’ll be able to enjoy over 13,500 hectares (about 33,000 acres) of un- spoilt, game-rich Bush in near solitude. Experienced Trackers and Game Rangers will accompany you on game drives in open Land Rovers, tracking the ‘Big five’ and sharing with you their vast knowledge of the surrounding wildlife. Ulusaba is approximately a 1 hour 20 minute flight by twin- engine aircraft to the Ulusaba airstrip from Johannesburg In- ternational Airport (also known as o.R. Tambo Airport) and 30 minutes from kruger Mpumalanga International Airport (kMIA) in Nelspruit. Retreat in style and comfort at the two lodges; Rock Lodge is perched high on the summit of a koppie (rocky hill) and includes Ulusaba’s newest addition Cliff Lodge, whilst 0.5km away Safari Lodge is built along the banks of the dry Mabrak riverbed. Many guests choose to split their stay between both lodges and have the advantage of keeping the same Ranger and Tracker. Rock Lodge – Set against the backdrop of the Drakensberg Mountain range, each room has been designed with the colours of a different African tribe or region. Rock Lodge can accom- modate a total of 20–25 guests in its 10 rooms and welcomes children of all ages to the Ulusaba Cub’s Club. Safari Lodge – Guests will love the sense of ad- venture as they cross the swing bridges between exquisite tree house rooms, created and inspired by local and natural materials, with elephants, bushbucks, lions and other local wildlife passing by. Safari Lodge can accommodate 22 guests in its 11 rooms. Apart from twice daily game drives and a daily walk in the Bush with a Ranger and Tracker, guests really need to plan their days to enjoy the other facilities available at Ulusaba. Soak up some sun by the pool or relax at the Aroma Boma Beauty Treat- ment Centres with a wide range of treatments. for the more active, play tennis on a floodlit tennis court with a fully stocked bar or work out at the fully equipped gyms any time of the day. Visit the wine cellar at Safari Lodge for a spot of wine tast- ing with an outdoor dining area for up to six guests or go star gazing at the observatory tucked away in the Bush. They can also arrange cultural, wildlife or scenic tours including helicopter trips and a tour of the local community at an extra cost – the proceeds from the community tour are donated to the local village. Don’t forget to pick up some mementos of your stay at the Gift Shop at Safari Lodge. Dine by firelight, candlelight or star light – feast on a traditional Braai in the heart of the Bush, or sample the local specialties over- looking the animals wandering by. Let Ulusaba know what you like and they’ll be happy to make it for you. Breakfasts and lunch- es are organised ‘restaurant style’, but in the evenings guests dine together at communal tables, comparing notes on the animals they spotted that day! of course, if you’d like a more intimate ex- perience, they will be delighted to organise private dining for you just give them a bit of notice. Ulusaba means ‘place of little fear’. It was once occupied by the Shangaan tribe and used as a lookout point during battles. The site of Rock Lodge was a prime position, providing a safe-haven for the tribe. The enemy was unlikely to win, as surprise attacks were near to impossible, hence ‘place of little fear’.